How To Become A Real Estate Agent And Consultant In Lagos Nigeria – Free Tips And Practical Training. Start A Real Estate Business. Become A Millionaire In 90 Days or Less! How to become a real estate agent in Lagos Nigeria – One of the frequently asked questions by visitors to this Lagos Nigeria real estate website relates to how to become a real estate agent or consultant. This page has been created to answer that question. Follow the simple steps below to become a successful real estate agent (or realtor or consultant) anywhere you live in Nigeria. The above are the 5 simple steps on how to become a real estate agent (or real estate consultant) in Nigeria. There is money in Nigeria real estate business if you do it right. That is why thousands of people have jumped into the real estate business in Nigeria. For example, a colleague registered as a consultant with a real estate company in Lagos Nigeria and within 4 months in the business, she earned a total commission of =N=2.79 million. Another consultant got a customer who bought 70 plots of land in one of the estates in Ibeju Lekki Lagos. At the time, each plot was selling for 7 million Naira. Therefore, 70 plots amounted to 490,000 million Naira. Her commission on the transaction was 15% of the value of the transaction. That is, her commission was 73.5 million Naira. 73.5 million Naira from just one transaction! Yes, real estate is the new GOLD! Thinking of becoming a real estate consultant (or realtor) in Nigeria? Want a business that will enable you destroy poverty once and for all? Want to become a millionaire in 90 days or less? 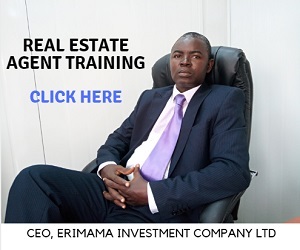 The first step is to acquire the right knowledge by attending a practical real estate agent training in Nigeria. With this option you simply download the real estate agent training manual, read it from cover to cover and register as an agent with our Nigeria real estate agent network. Once you become a registered member of our agent network, you can starting advertising the properties in our portfolio and earn commission when you refer paying clients. What does the training manual cost? The second option is to attend our live one-on-one coaching program. This one-on-one real estate agent training program will help you grasp the concepts faster and increase your chances of becoming a successful Nigeria property consultant. What does this one-on-real estate agent coaching program cost? Download Module 1 of The Training Manual FREE! The Nigeria real estate agent training manual comprises 8 modules each covering different aspect of the real estate agent course. Want to test-drive the training quality before buying? We are offering you module 1 of the real estate agent training manual FREE! Fill the simple form below and click the submit button to get started. P.S: Having difficulty submitting the form? Call Samson Itoje on 07086459367 or 08033290430 for assistance.